Cutting and handling chicken wire may require some patience and determination, but once you become familiar with the material it can be an invaluable tool for arts-and-crafts project. It is ideal for making one-of-a-kind shapes, decor, sculptures and more. 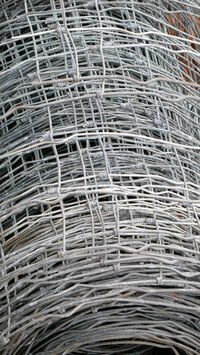 Chicken wire is also an affordable material that can be found at most home-supply stores. Chicken wire can be used to make personalized floral wreaths. These may be holiday decorations, or simply a way of bringing the beauty of the outdoors into a home. You can use synthetic plants to make a custom wreath that will last indefinitely, or use organic materials that have a shorter shelf life. Cut chicken wire using wire cutters. Be sure to wear thick gloves to avoid cutting your hands. Cut your chicken wire so it is approximately 6 inches wide and 40 inches long, depending on the circumference of wreath you are planning. Roll the chicken wire into a tube and secure along its edges with wire ties. Pack the wire cylinder with moss. Add wired bunches of leaves, flowers, fruit, pine cones or even fabric. Once decorated to your liking, bend the chicken-wire tube into a circle. Secure the ends together with wire. Add a loop of string, ribbon or yarn to hang your wreath. With a little patience and some simple tools, you can use chicken wire to make a variety of holiday-themed crafts for any type of festivity. For Halloween, use chicken wire to sculpt a large spider to hang on your door. Shape the chicken wire into a domed octagon to make the spider’s body and layer with foam and batting. Stretch the fabric to wrap around a piece of pegboard cut to match the body and staple to the back of the pegboard with a staple gun. Attach legs made of craft wire and wrapped with black garland. For Easter, follow a similar pattern with chicken wire, pegboard, foam and batting but make the shape of a bunny, using garland for the ears. This process can be followed for any holiday symbol and placed in the yard or hung on a wall or door. For the artist, chicken wire can be the perfect base for sculptures. While wearing gloves, cut the chicken wire to form the base of your desired project. Use sharp wire cutters so you can make the precision cuts you need. Bend and squeeze the wire as needed to take on your shape. If needed, connect ends with craft wire. Dip sheets of newspaper into a solution of glue and water. Squeeze off excess moisture and wrap around the outside of your chicken wire shape. Repeat with four to five layers for a sturdy sculpture. Let dry fully in between layers of newspaper for at least 24 hours. Once dry, sand and paint as desired.